In November last year, parts of the Johannesburg Parks region were hit by a devastating hail storm. Large hail stones fell with a ferocious intensity. They shredded leaves of agapanthus and arums, as well large robust trees, and reduced every impatience and begonia plant to a bruised and damaged lone green stalk. Of course the Pollyannas/’every- cloud-has-a-silver-lining’- chirpers all said ‘But hail has so many nutrients it will all come back’. Cynical as ever I muttered under my breath ‘Yeah right’. But, yet again I had to eat humble pie. 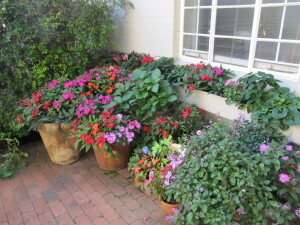 The flowers have all come back with a vengeance and have provided an amazing display in Liz at Lancaster’s garden and potted plant areas. Alick, Liz at Lancaster‘s wonderful gardener said to Liz rather bashfully: ‘I talked to them’. Well Alick – it worked! Thank you Alick and thank you hail!